Prizemediayou.com is the PUP that uses misleading techniques to prevent removal. Use Reimage to locate malicious components and get rid of them faster than with uninstall instructions. A full system scan blocks virus reappearance and prevents traffic to malicious domains. Prizemediayou.com is causing redirects to commercial sites. Prizemediayou.com is an advertising network which can initiate serious havoc on Google Chrome, IE, Mozilla Firefox or another web browser. Being categorized as an adware or a potentially unwanted program, this virus starts displaying misleading ads, in-text links, banners and similar advertising content on each of your favorite websites. While it might seem that your favorite websites were changed by their developers, it is not true. The adware which is hiding behind the Prize Media You is the one to blame in this case. Beware that Prizemediayou.com ads can easily redirect you to malicious websites that are filled with serious malware or interrupt you with survey ads used to swindle personal information. The most common features of these potentially unwanted programs are the ones that frustrate people while surfing online. This program has no official site that could work as a fake search engine or software provider/scammer. That's because Prizemediayou.com is an advertising network which has been misused by adware developers while trying to create revenue. It is generated once the ad redirects the user to the affiliated site or receives a click from the victim. In the meanwhile, users who are dealing with such activity are suffering from serious issues while trying to surf the web. Redirects to unknown websites can not only stop you from finding what you need. Constant pop-up ads can also affect the general performance of your device. To prevent such issues, you should remove Prizemediayou.com virus from your computer. In this case, you should find all adware-type viruses hiding on the system. To detect these potentially unwanted programs, you should run a full system scan with Reimage or other anti-malware programs. Prizemediayou.com is a program designed to display ads. If you tend to rush installation process of the freeware, be aware that this can cause some unwanted activity on your device. During the installation process of the freeware, people tend to select Quick or Default options. However, by choosing these options, you cannot see what software bundles are hiding inside your software and what processes are initiated behind your back. To prevent this from happening, make sure you opt for Advanced or Custom settings to see what additional programs are hiding inside. Additionally, you will have to de-select additional programs from the list and finish the installation process. If not, you might get some programs you don't need. To remove Prizemediayou.com virus, you should use anti-malware tools to perform a full system scan on your device. Since this is a program that comes silently, it may have additional pieces that can be hidden deep inside the system. If you try to find and uninstall them manually, you might be involved into a time-consuming task. However, if you are not willing to use anti-malware tools for Prizemediayou.com removal, you can try to find all these programs that are can be related to this virus yourself. In this case, follow a detailed guide given below. However, don't forget that adding reliable anti-spyware to your system could be a good addition to your computer's security level. Occasional system scans can help you avoid infections in the future. 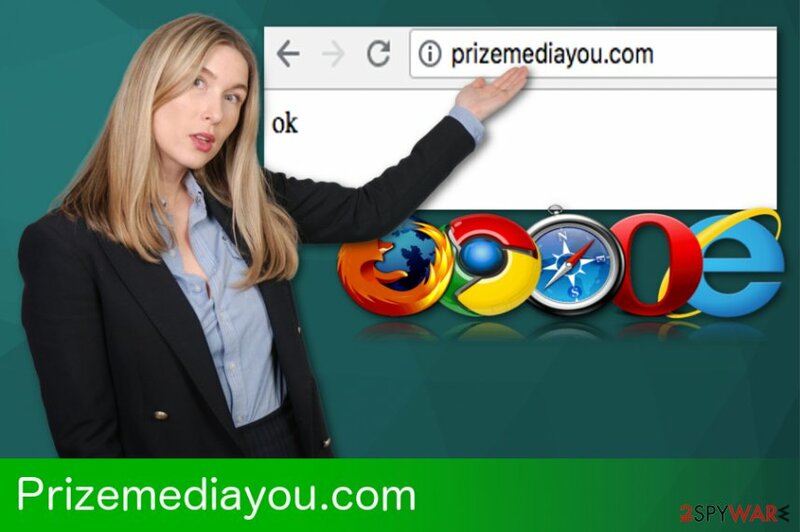 Here, look for Prizemediayou.com or any other recently installed suspicious programs. Wait until you see Applications folder and look for Prizemediayou.com or any other suspicious programs on it. Now right click on every of such entries and select Move to Trash. When in the new window, check Delete personal settings and select Reset again to complete Prizemediayou.com removal. Once these steps are finished, Prizemediayou.com should be removed from your Microsoft Edge browser. Here, select Prizemediayou.com and other questionable plugins. Click Remove to delete these entries. Now you will see Reset Firefox to its default state message with Reset Firefox button. Click this button for several times and complete Prizemediayou.com removal. Here, select Prizemediayou.com and other malicious plugins and select trash icon to delete these entries. Click Reset to confirm this action and complete Prizemediayou.com removal. 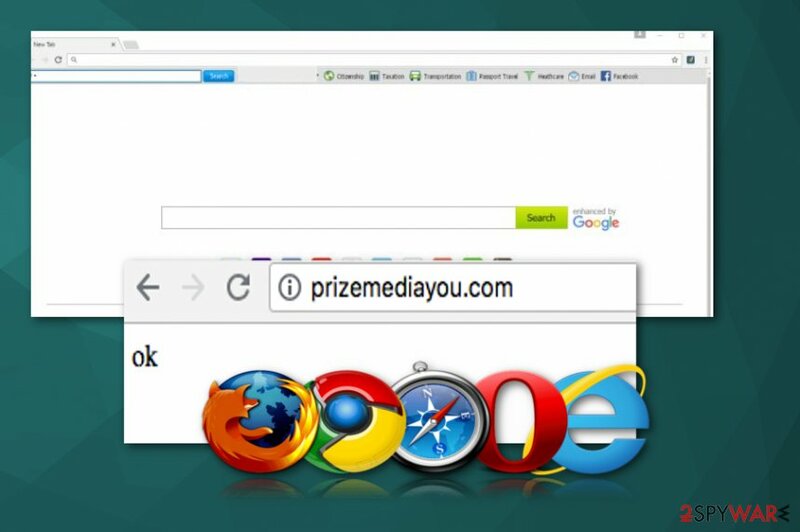 Here, select Extensions and look for Prizemediayou.com or other suspicious entries. Click on the Uninstall button to get rid each of them. Now you will see a detailed dialog window filled with reset options. All of those options are usually checked, but you can specify which of them you want to reset. Click the Reset button to complete Prizemediayou.com removal process. ^ Chris Hoffman. PUPs Explained: What is a “Potentially Unwanted Program”?. How to geek. IT education. ^ Virusler. Virusler. Spyware news. This entry was posted on 2019-04-01 at 14:01 and is filed under Adware, Viruses. You can quickly scan the QR code with your mobile device and have Prizemediayou.com manual removal instructions right in your pocket. How did you remove Prizemediayou.com?